The second edition of An Introduction to Nonlinear Finite Element Analysis has the same objective as the first edition, namely, to facilitate an easy and thorough understanding of the details that are involved in the theoretical formulation, finite element model development, and solutions of nonlinear problems. 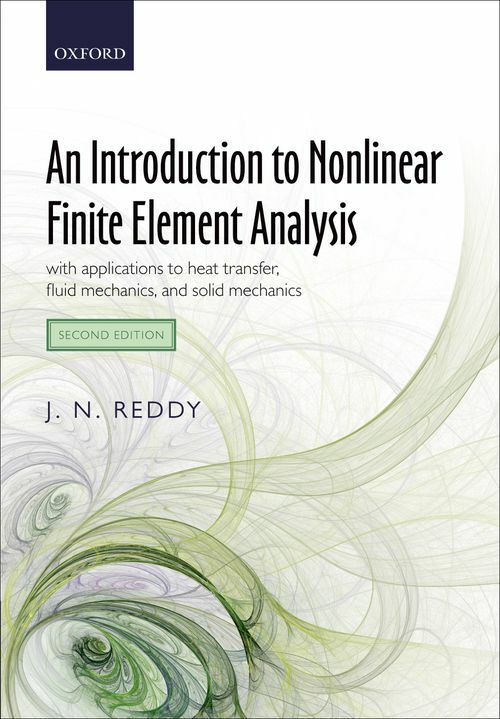 The book offers an easy-to-understand treatment of the subject of nonlinear finite element analysis, which includes element development from mathematical models and numerical evaluation of the underlying physics. The new edition is extensively reorganized and contains substantial amounts of new material. Chapter 1 in the second edition contains a section on applied functional analysis. Chapter 2 on nonlinear continuum mechanics is entirely new. Chapters 3 through 8 in the new edition correspond to Chapter 2 through 8 of the first edition, but with additional explanations, examples, and exercise problems. Material on time dependent problems from Chapter 8 of the first edition is absorbed into Chapters 4 through 8 of the new edition. Chapter 9 is extensively revised and it contains up to date developments in the large deformation analysis of isotropic, composite and functionally graded shells. Chapter 10 of the first edition on material nonlinearity and coupled problems is reorganized in the second edition by moving the material on solid mechanics to Chapter 12 in the new edition and material on coupled problems to the new chapter, Chapter 10, on weak-form Galerkin finite element models of viscous incompressible fluids. Finally, Chapter 11 in the second edition is entirely new and devoted to least-squares finite element models of viscous incompressible fluids. Chapter 12 of the second edition is enlarged to contain finite element models of viscoelastic beams. In general, all of the chapters of the second edition contain additional explanations, detailed example problems, and additional exercise problems. Although all of the programming segments are in Fortran, the logic used in these Fortran programs is transparent and can be used in Matlab or C++ versions of the same. Thus the new edition more than replaces the first edition, and it is hoped that it is acquired by the library of every institution of higher learning as well as serious finite element analysts. The book may be used as a textbook for an advanced course (after a first course) on the finite element method or the first course on nonlinear finite element analysis. A solutions manual is available on request from the publisher to instructors who adopt the book as a textbook for a course. J. N. Reddy is internationally known for his contributions to theoretical and applied mechanics and computational mechanics. He is the author of more than 500 journal papers and 18 textbooks with multiple editions. He is the recipient of numerous awards including the Nathan M. Newmark Medal from the American Society of Civil Engineers, the Computational Solid Mechanics Award from the U.S. Association of Computational Mechanics, and the Computational Mechanics Award from the Japanese Society of Mechanical Engineers. Professor Reddy is a Fellow of AIAA, ASCE, ASME, American Academy of Mechanics, the American Society of Composites, the U.S. Association of Computational Mechanics, the International Association of Computational Mechanics, and the Aeronautical Society of India. He is a life fellow and Honorary Member of ASME.